It's time for another Lightning Flash giveaway hosted by Sony Pictures Entertainment and NCM Fathom Events! 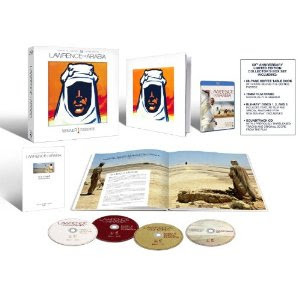 I'm giving a way 3 pairs of tickets for Lawrence of Arabia (1962) screening on Thursday October 4th in select US theaters. Check out NCM Fathom Events' official page for the Lawrence of Arabia event for details on where it's showing. The event features an introduction by Omar Sharif, a newsreel from the New York premiere of Lawrence of Arabia, an interview with Director Martin Scorsese and some extra fun features. The film has been digitally restored in celebration of the 50th anniversary. You can enter to win a chance to see this here! It's a lightning flash giveaway so please be prepared to respond ASAP to my email if you are contacted. Read the rules and regulations and fill out the form below. 2) Enter by Sunday September 30th at Noon EST. 4) There is only ONE SHOWING. If you are not available to see this on Thursday October 4th, please do not enter this contest. 5) If you win, you must reply to my announcement email by 8 am EST on Monday October 1st so NCM Fathom can get you the tickets. Winners are Merry, Steve and Bill. Congratulations! Thank you to everyone who participated. Of course, I had to enter for this one too! Do you know, I've only seen Lawrence on the big screen? I saw it once when I was little, and I have not seen it since. Some scenes made quite an impact on me, and I've always wanted to see the movie again to see how that moments fit into the whole.